Linoleic Acid (LA) Market size is set to surpass USD 3.5 billion by 2024; according to a new research report by Global Market Insights, Inc.
Linoleic acid is an essential omega-6 fatty acid. Diet rich in LA and its supplements, decrease complication and risk of chronic diseases, including hypertension, diabetes, improves memory, slows ageing, cancer, strokes and heart diseases. Rising living standard and increasing awareness in consumers for health benefits will drive linoleic acid market size. Increasing intake of linoleic acid as essential nutritional component by consumers will lead to growing product demand. Consumers are embracing healthy practices including yoga, gym and healthy dietary consumption to lead a healthy lifestyle. This has led to growth in demand for health-related products including organic food, dietary and sports supplements positively favoring industry growth. France linoleic acid market size is anticipated to surpass USD 190 million in the projected timeframe. Growing awareness of potential side-effects due to many artificial substances used in beauty and personal care products will increase consumer inclination to adopt natural and organic products which should propel product demand. Commercial production is highly dependent on raw materials price fluctuations. 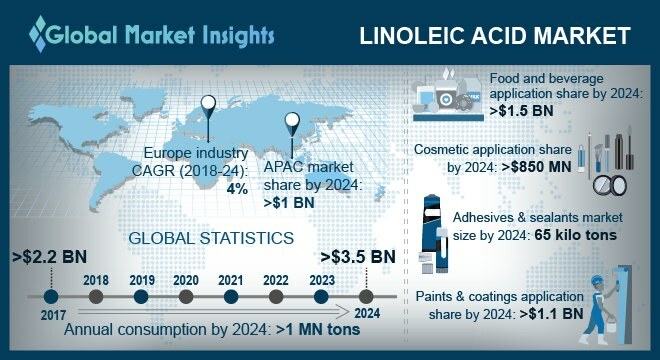 Sourcing of raw materials, transportation and risk of procurement due to seasonality may hamper industry profitability, thereby affecting linoleic acid market price trend. However, increasing R&D investments, infrastructural capabilities will lead to expansion of LA based product portfolio and application scope propelling industry growth. Linoleic acid market size from paints & coatings application may exceed to USD 1.1 billion up to 2024. It enhances texture, is color retentive, and dries quickly making it useful in automotive and marine equipment painting. Manufacturers are engaged in strategic expansion through mergers & acquisitions, and partnerships to increase their production capacity, product portfolio, and geographical presence, thus driving industry growth. Japan linoleic acid market size is anticipated to surpass USD 170 million by 2024. Increase in life expectancy supported by shift in consumer focus on routine healthcare then spending on hefty medical bills may fuel product demand. Easy availability of LA owing to its renewable nature and technological developments in extraction process may positively effect industry growth. Linoleic acid market size from cosmetic application is anticipated to exceed USD 850 million by 2024. Increasing demand for organic skin care products coupled with strict adherence to quality, packaging and good shelf-life will drive the industry demand. Cosmetic industry is a major end-use industry for the product owing to its properties of moisturizing, anti-inflammatory, healing support to the skin, helps in softening the skin, fight acne and keeps skin youthful. It is used as an emulsifier in soap and quick drying oil production. Global linoleic Acid market share is moderately consolidated with some of the manufactures which includes Acme Synthetic, Penta Manufacturing, Caila & Pares, Univar, Beijing Lys Chemicals, S A PharmaChem., Synerzine. Companies are entering into strategic partnerships for joint ventures to expand their product offerings and regional presence which is likely to favor industry growth.